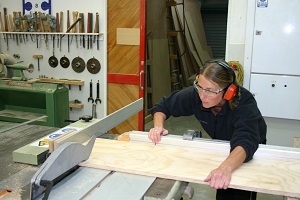 A follow-on course for those who have completed our "Woodwork - The Basics" or "Woodwork - Beginners" course. No second-hand timber allowed. Have you done one of our beginner courses or workshops with Paul and are keen now to further develop your skills by working on an achievable project (details to be discussed with Paul)? You must have completed our beginner course/workshop and be confident operating heavy woodworking machine tools, such as dimension saws, thicknessers, band saws etc. Limited to ten participants. The first session involves students sharing plans and ideas relating to their projects. Health and safety, machinery bottlenecks and house keeping are also covered. The session usually lasts for an hour and no practical takes place - the remaining hour is added on at the final two sessions of the course. Bring a sketch of your achievable idea to the first session. NOTE: Second-hand timber may not be machined in any woodwork course. Please wear clothing and footwear suitable for a workshop environment. For those who have completed either the Wellington High School "Woodwork - The Basics" workshop or the "Woodwork - Beginners" course - you must be familiar with operating heavy woodworking machine tools, such as dimension saws, thicknessers and band saws.